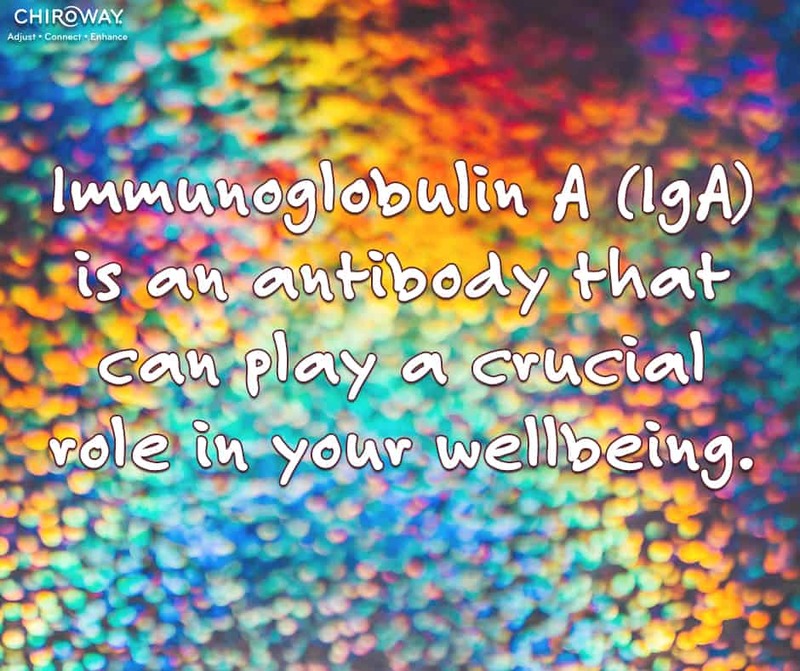 Immunoglobulin A (IgA) is an antibody that can play a crucial role in your immune function. Antibodies are proteins produced innately in response to substances that your body believes to be foreign, like bacteria and viruses. IgA is located within your mucosal membranes (ex: saliva, respiratory and digestive tract) and blood. IgA interacts with foreign substances to create a neutralization of the pathogen. Adequate levels of IgA can be correlated with adequate immune function: the more IgA you have, the more effective your immune system is. Your IgA levels are part of your immune system which is a network of cells, tissues and organs that work together to attack foreign substances that try to invade your body. Your immune system is regulated by your neurological system through the brain sending messages down your spinal column to the appropriate cells, tissues and organs that produce the chemical production of your immunoglobulins, like IgA. What’s the value of knowing what IgA does? It can help give you an idea of how specific chemicals within your body can affect the function of your wellbeing and how your body’s innate intelligence utilizes a balance in your body chemistry for overall function. Immunity can be improved through positive lifestyle choices like nutrition, exercise and rest. Chiropractic can be one more strategy to help enhance your overall wellbeing. Chiropractic does not seek to improve immunity, but rather remove interference from the neurological system that helps coordinate a balance in your body chemistry. Dysfunction in the spine can affect the entire body’s wellbeing due to the following principle: in order for the whole to be 100%, the parts making up the whole need to be 100%. Chiropractic can help facilitate your innate recuperate powers to move towards wholeness through the relationship between structure and function that affect the neurological system’s ability to coordinate optimal wellbeing. Choose regular chiropractic care as a positive impact on your wellbeing!